Billie Lourd spotted before her grandmother's shocking death. 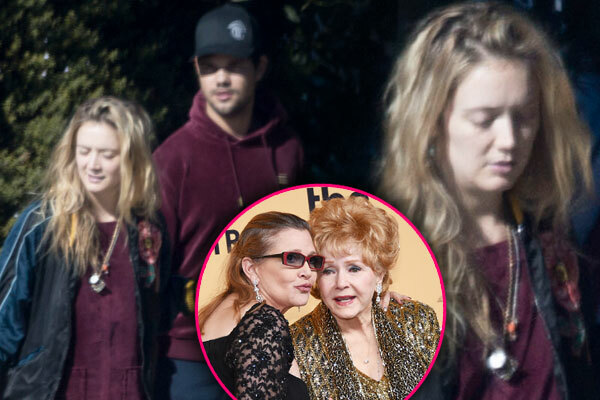 Carrie Fisher's heartbroken daughter, Billie Lourd, was seen before her grandmother, Debbie Reynolds, was rushed to the hospital for a "possible stroke," a shockingly passed away on December 28, 2016. Click through the gallery to see the young actress one day after her mother's tragic death. EXCLUSIVE: **PREMIUM EXCLUSIVE RATES APPLY** Billie Lourd leaves her Santa Monica home with rumored boyfriend Taylor Lautner, a day after the death of her mother, Carrie Fisher. Lourd, 24, was spotted outside her home in Santa Monica, Calif. just one day after her mother's shocking death. Carrie Fisher's only child was carrying a suitcase outside her home and wearing a mini dress with a jacket. Lourd, the daughter of the Star Wars actress and Bryan Lourd, was accompanied by Taylor Lautner. Lautner and Lourd starred together on the television show Scream Queens. The couple were spotted kissing earlier in the year, fueling rumors of a romantic relationship. Lautner wrote a touching tribute to Lourd after her mother's death on his Instagram page, noting: This girl is one of the strongest, most fearless individuals I've ever met. Absolutely beautiful inside and out. I'm lucky to know you. "Fisher's daughter immediately fled to the hospital to be with her mother on December 23, 2016, hours after she had a heart attack aboard a UNITED Airlines flight. Fisher's daughter immediately fled to the hospital to be with her mother on December 23, 2016, hours after she had a heart attack aboard a UNITED Airlines flight. Lourd had a surprise cameo in her mother's last Star Wars film.Her grandmother, Debbie Reynolds, was rushed to the hospital after these photos were taken. Paramedics were called for a "possible stroke," a source told Radar. She passed away on December 28, 2016. Her grandmother, Debbie Reynolds, was rushed to the hospital after these photos were taken. Paramedics were called for a "possible stroke," a source told Radar. She passed away on December 28, 2016. According to her uncle, Todd Fisher, Reynolds was "not ok," after being rushed to the hospital. Stay with Radar for updates to the story.